This is the grande finale of my Nine Quilts by Christmas Series! If you’d like to see where is all began, click here. To see the previous eight quilts, click the corresponding number: one, two, three, four, five, six, seven, eight. And here we are! What a journey! Thank you for coming with me! And let me introduce you to quilt number nine, that was given to Miss M. Miss M is four, and her nickname is Firecracker – it’s quite apt for this bundle of adorable energy. The pattern is Powwow by Allison Harris of Cluck Cluck Sew, and the fabric is entirely from Flow by Zen Chic for Moda. The backing is a light coral-y pink suede flannel, and the quilting was a scrolling pattern. It seems kind of appropriate that the biggest hiccup I had in my making of these nine quilts was on the quilt for Firecracker. With a name like that, it seems inevitable that drama will ensue! I am incredibly blessed to have access to the long-arm quilter at Marcelle’s Patchwork Cottage, and the quilting machine and I had a disagreement halfway along the last row of quilting (entirely user error!) that left the tension in the bobbin thread awfully wacky. The consequence was that I had to unpick the entire bottom row of quilting, which took hours. Luckily, I had excellent help (thanks hubby!)! I actually need to give a massive shout out to the crew at Marcelle’s Patchwork Cottage. All of the ladies there were so patient with me hogging the quilter, so kind and affirming with my design decisions, and so encouraging when I was feeling overwhelmed. More than one of them helped out with unpicking some stitched on this quilt when my hands were cramping up, and not all of them were paid to be there! I’m SO thankful for the loving environment in that shop, and especially to Marcelle, the shop owner, for her love and support on this epic journey, and for giving me the capacity to neglect some of my other responsibilities in order to finish these on time. It definitely didn’t go un-noticed. Miss M definitely had the MOST fun response to receiving her quilt. I wish everyone was as excited as a four-year-old when they receive a quilt! She dragged it around, and kept rolling herself up in it, or just jumping up and down on it. Ironically, she liked the (fluffy) backing side better, and kept laying out the quilt with the backing facing up – but that’s ok with me. As long as she loves it! And that’s it! What an adventure! Given it seemed like a near-impossible task when Christmas was six weeks away, it felt completely amazing when I finally finished those last stitches on the bindings and labels. In some ways, the deadline was SO good for me – it forced me to get outside of my comfort zone – to keep pressing on with tasks even when I was bored or frustrated with them, and to be resourceful and the make the most of what I had, because I didn’t have time to wait for or investigate other options. There was no time to feel sorry for myself when things went wrong – I just had to keep going. I wouldn’t want to work under those kinds of timelines constantly, but I learnt so much about myself, and I think I’m a better Creative for it. Thank you so much for coming on this journey with me as I shared these quilts! But I hope it’s not the end of you dropping by my blog. I’ve already been madly making all sorts of bits and pieces to kick off 2018, and I will keep sharing them with you here! So hopefully you’ll check in again soon – or you can sign up to follow my blog and receive notifications each time there’s a new post! This is the next in my Nine Quilts by Christmas series. For the story on how it all began, click here. To learn more about the previous quilt in the series, click on the relevant number: one, two, three, four, five, six, and seven. For quilt number nine, stay tuned! This quilt was for Miss E, who is seven, lively, playful and cheeky. Miss E has very little concept of walking – she runs, or dances, or bounces. So I felt the fabric Best. Day. EVER! from April Rosenthal for Moda was a perfect match. This quilt pattern is called Sweets, and it’s by Allison Harris of Cluck Cluck Sew. The border fabric is a pink stripe from the Best. Day. EVER. line, and the yellow is from Kate Spain’s Grand Canal range for Moda. The backing is a pink suede flannel. The quilting was a paisley design. Miss E looked pretty happy with the result! And so that makes eight! Next time is the last one! I hope you’ve enjoyed the series so far, and join me again for the wrap up. This blog post belongs to my Nine Quilts by Christmas series. Click here to see where it all began. Click the relevant number to see quilts one, two, three, four, five, or six. For quilts eight and nine, stay tuned! This quilt was gifted to the lovely Miss L. I wanted to make her something that was fun, and young, but not too girly, and not so young that it wouldn’t grow with her. The pattern is Tumble by Allison Harris of Cluck Cluck Sew, and the fabric, once again, is a bit of everything there ever was! Cotton and Steel, Moda, Cloud 9, and all sorts of other bits and pieces from my stash. Not going to lie – I really love this pattern. I’ve made it a few times, and it’s quick, simple, and effective, every time. It was kind of fun to include a nod to Miss L’s heritage in the fabrics – can you spot it? The border fabrics are a navy grunge, and an Alison Glass 2017 Sunprint. This was the first time I’d ever laid eyes or hands on an AG fabric, and I was pretty stoked!!! The backing is a blue suede flannel. I think the quilting pattern is called Fruitopia. And here is Miss L with her finished quilt! Like her brother, Master N, she had the quilt on her bed the next day, and took it camping too! I loved seeing it in action so soon! And I love that kids aren’t too precious about their quilts. Sometimes it can be a bit scary letting go of that crisp and pristine quilt, but it’s so worth it to see it so thoroughly loved! Next up is Miss E! We’re nearly on the home stretch! Thanks for stopping by, and I hope you’ll be back soon for the next installment. This is the next in my Nine Quilts by Christmas series. To find out how the series began, click here. To see quilt one, two, three, four, or five – click on the relevant number! For quilts 7-9, stay tuned! Ok, ok, so I’m slightly behind my intended schedule of sharing these quilts, but I’m excited to keep bringing the updates just the same! So here is my quilt for Master P! This lovely young man loves animals, so this quilt was a perfect match! The pattern is Lucky by Allison Harris of Cluck Cluck Sew. The fabric is entirely Big Sky by Annie Brady for Moda. The finished quilt is 63″ x 77″. Those bears are SOOO cute! I quilted this one with a leafy design – attempting to keep it natural and outdoors-y! Master P seemed pretty excited that the quilt matched his new animal-themed room decor! So there you have it! We’re now on the home stretch of sharing these quilts, with three to go. Looking forward to it! This post belongs to my Nine Quilts by Christmas series. Click here to see how it all began. Click on the following to see quilt one, quilt two, quilt three, or quilt four. For quilts six to nine, stay tuned! This quilt went to Master N, the “middle child” of all the nieces and nephews. To be totally honest, Master N sure knows what he likes, and it was his approval that I was most anxious to receive! The quilt pattern is double-crossed by Amy Smart of Diary of a Quilter. The finished quilt measures 61″ x 75″. My colour scheme is quite similar to her original – I just couldn’t help being drawn to those blues and greens! The fabrics are a truly random selection from my stash – I couldn’t begin to tell you what’s included in the center panel! The border fabrics are a green plus from Sunday Supper by Sweetwater (Moda), and navy ovals from… you know what? I’ll have to go back and check! (It’s still in the shop, but I forgot to write it down!). The backing is a royal blue suede flannel, and the quilting is modern circles. Master N was a bit so-so to start – and wouldn’t even unroll his quilt for a photo for me (as evidenced below), but he quickly warmed up to it over Christmas day, and was stretched out and chilling on it before long. When I visited his house the next day the quilt was on his bed, and then dragged out to the swag for his camp-out that night. I’m counting it as a win! One last boys quilt to share this week, and then three more girls to finish the series. I’m excited to show you the rest! Don’t forget you can sign up to receive notifications each time I post a new blog – it’s an easy way to make sure you don’t miss the rest! This blog post belongs to my “Nine quilts by Christmas” series. If you would like to read how it started, click here. If you would like to see quilts one, two, and three, please click on the relevant number. For quilts five to nine, stay tuned! This quilt was for Master D. The pattern is Hello March by Allison Harris of Cluck Cluck Sew, and the fabric is entirely pulled from the shelves of my local quilt store – Marcelle’s Patchwork Cottage. There’s a bit of Sunday Supper (Sweetwater for Moda), Grunge (Basic Grey for Moda), Tabby Road (Tula Pink for Free Spirit), and more. Red’s not normally my colour (give me blue any day! ), so I was intentional about including it in this one, and I’m really happy with it. The pattern was super quick and easy. I loved watching this one come together so swiftly! The final quilt size was 61.5″ x 75″. Master D is my husband’s godson, so hubby was thrilled when we got the chance to help me longarm quilt it. He did most of it himself. It was pretty cute. We used a modern geometric (squares and circles) pattern on this one. The border fabrics for this one are from V and Co’s Spectrum collection (navy), and the grey is from Desert Blooms by Sheri and Chelsi, both for Moda. The backing is a red flannel from Moda. And that’s it! Master D seemed to think the result was snuggly enough, so I’m counting it as a win! I have two more boy quilts to share this week! Can’t wait to show you! Note before you start: This post details quilt number three of my nine quilts by Christmas series. Click here for an overview of all nine quilts. Click here for details on quilt one or quilt two. For quilts four to nine, stay tuned! And at last! We have the first boy’s quilt! This pattern is Hideaway by Allison Harris of Cluck Cluck Sew. It was a little fiddly at first to get those center crosses right, but then it came together very quickly because the rest of the block is SO big! I am really happy with how it turned out. The finished quilt size is 67.5″ x 57.5″. I really loved picking out the colours and fabric for this one. It’s quite the variety, mostly picked out from my local quilt shop – Marcelle’s Patchwork Cottage: a little Sunday Supper (Sweetwater for Moda), a little Flow (Zen Chic for Moda), a little Best. Day. Ever. (April Rosenthal for Moda), a little Grand Canal (Kate Spain for Moda), and a little Grunge (Basic Grey for Moda). There’s a few other wild cards in there that I don’t actually know what they are because I picked them up in mystery boxes in my early stash-building days. The orange border and binding is from Flow by Zen Chic (Moda) and the navy plus border is from Sunday Supper by Sweetwater (Moda). The quilting is a square dance edge-to-edge design, and it’s backed in grey suede flannel. And Master C seems pretty happy with it! We’re going to smash out the remaining three boy quilts over the next week, so I hope you’ll be back soon! 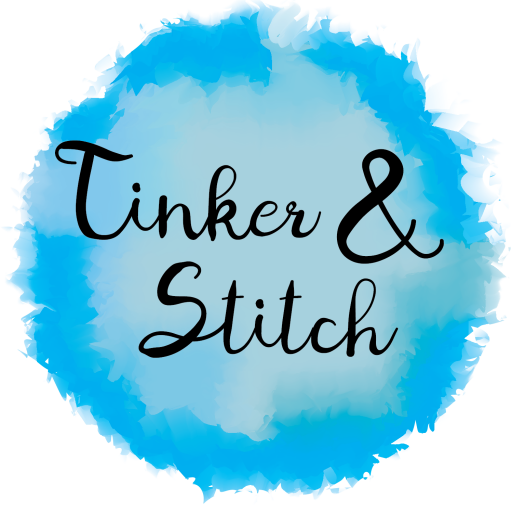 Welcome to Tinker & Stitch. Feel free to have a look around, and if you have any questions, don't hesitate to make use of the contact page!